We’re barely into September and already autumn is here in Shropshire. 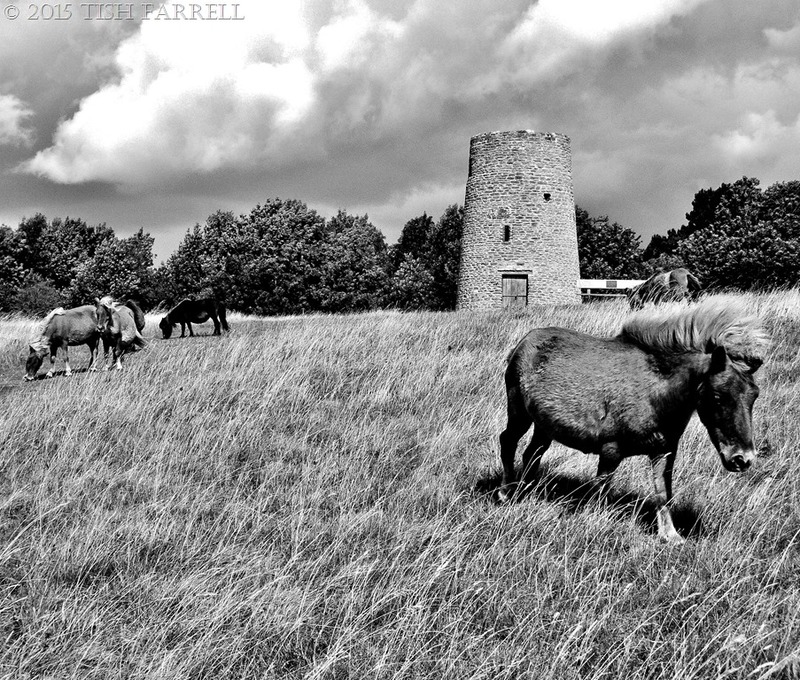 It must be so, because the little horses are back on Windmill Hill. They will spend the next few months grazing off the dying summer grasses and wild flowers. They look very windswept, but the punk-mane-effect is mainly down to thickets of cleavers (goose grass) seeds in their top knots. Looking across the hill there’s hardly a sign of the June-July flowering – all those buttery clouds of Lady’s Bedstraw quite gone. Not a trace of the orchids either. Only the dark and brittle seed heads of knapweed that always strike a note of dreariness. The weather doesn’t help either. For weeks it has been rain between showers. Nor was I encouraged by the BBC radio science programme I heard yesterday. I caught it in the midst of recompiling a glut of runner beans into chutney (beans at least like rain). The guest climate experts were soon informing us that the El Nino effect they promised us all in 2014 did not come to much. In fact, they opined, (and they sounded quite definite about it too) we still have it very much to look forward to – the worst El Nino effect hitherto experienced, they said. For some reason the Pacific Ocean keeps heating up. And this means disrupted weather patterns worldwide, and for Europe, an even wetter winter than usual. MORE RAIN? I wish we in Shropshire could email some of it to those lands whose dramatically changing climates mean that they now receive little or none. Mongolia is one place suffering massive desertification. Likewise, the countries of Africa’s Sahel that border the Sahara. In both regions, and many others besides, human actions, poverty and climate shift combine in a vicious downward spiral that results in increasing degradation of land and water sources. This, apart from war, is one of the main drivers of human migration. It’s all connected, despite what the climate change naysayers may wish to believe. All of which is to tell myself to count my blessings. I am free to wander where I like without fear of being terrorized by extremists. I have all the food I need and more. I enjoy every comfort. 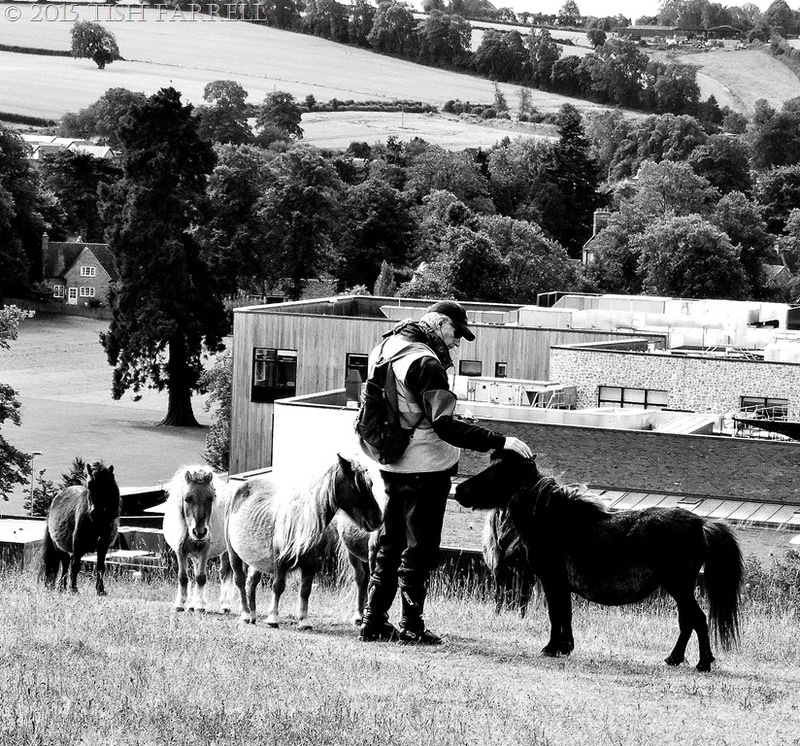 I have the luxury to meander along Shropshire byways, talking to little horses, musing on the meaning life, the universe and everything, while across the globe desperate others risk all to find somewhere they can live a decent life with their families. Some people, we hear, do not want to share their land with refugees. It is assumed that they will be nothing but a drain on resources. Yet who knows what gifts in talent and skills these homeless souls might be bringing us? Also, not sharing may cost us more than we could ever imagine. In some societies the truest measure of civilisation is the gift of hospitality. Perhaps we need to think about this with a little more application. At least, I know I do. Posted on September 4, 2015 September 4, 2015 by Tish Farrell	This entry was posted in Much Wenlock, photography and tagged climate change, Daily Post Weekly Photo Challenge, El Nino, little horses, mogrants, Much Wenlock, Shropshire, Tish Farrell Writer, Windmill Hill. Bookmark the permalink. I think some of those very wide ones might be in foal, Jude. Now that will be exciting, the prospect of very little little horses. As for the rest, the world may be warming, but the acts of corporations on the one hand, and of the struggling poor on the other combine to make the effects far worse. And then there are the unintended consequences. I was astonished to learn the other day that world lust for cashmere, and Mongolian herders rising to meet the demand is contributing to mass desertification in Mongolia. It’s frightening how desire for a fashion item (and who doesn’t like cashmere) can have such an appalling effect. Much as I like goats, en masse, they are incredibly destructive of fragile landscapes. Mmmm… goats do tend to decimate an area. That’s pretty grim news. Personally I can’t wear cashmere or lamb’s wool garments, they make me itch so I stick to cotton or man-made fibres. This is a marvelous post for the week’s WPC theme. Have a great weekend, all of you. Was thinking of your future travels. Have you got the Air B&B app? Thoughtful and well written post Tish. I admire the fortitude, resourcefulness, determination and dignity of those fleeing persecution and other horrors. Why wouldn’t we or any country want to welcome people with such wonderful attributes? That is such an excellent point, Rebecca. Brave, resourceful people are surely an asset anywhere. And to have been through what they have been through, and still have a vision of a better life indeed shows great fortitude. A beautiful post , in any sense. 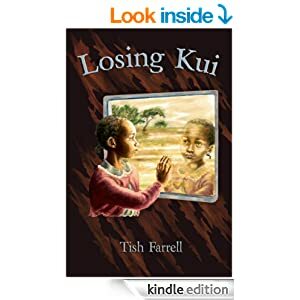 Thanks so much, Tish, for your words of peace and hope. What doesn’t happen so much in ordinary people’s conversations , at least where I live! Thank you for your kind comments. As to people’s antipathy to asylum seekers, somehow seeds of fear have been planted; a fear of being invaded perhaps; that there is not space or resources enough to provide for incoming strangers. I’m not sure why we think we do not have enough to share, or that incomers won’t have contributions to make to our communities. People who have paid extortionate sums of money to people-smugglers are anyway likely to have skills and qualifications that receiving countries could well be in need of. Thank you for this thought provoking post, Tish. Everything is indeed connected, including us humans. Yes, it’s something we often forget though, isn’t it Tiny – the connectedness. Politicians are particularly good at the divide and rule game, and this taps into our worst side, making us grudging and suspicious when we might gain so much from being more welcoming. Lovely photos (I particularly like the first) and such a beautifully-written, thoughtful post. Everything is indeed connected. Around here we’ve been having rain as well. It’s Spring this side and I just love the rain. Certainly a lot to be grateful for. Hello, lovely Sonel. Wishing you a good weekend. 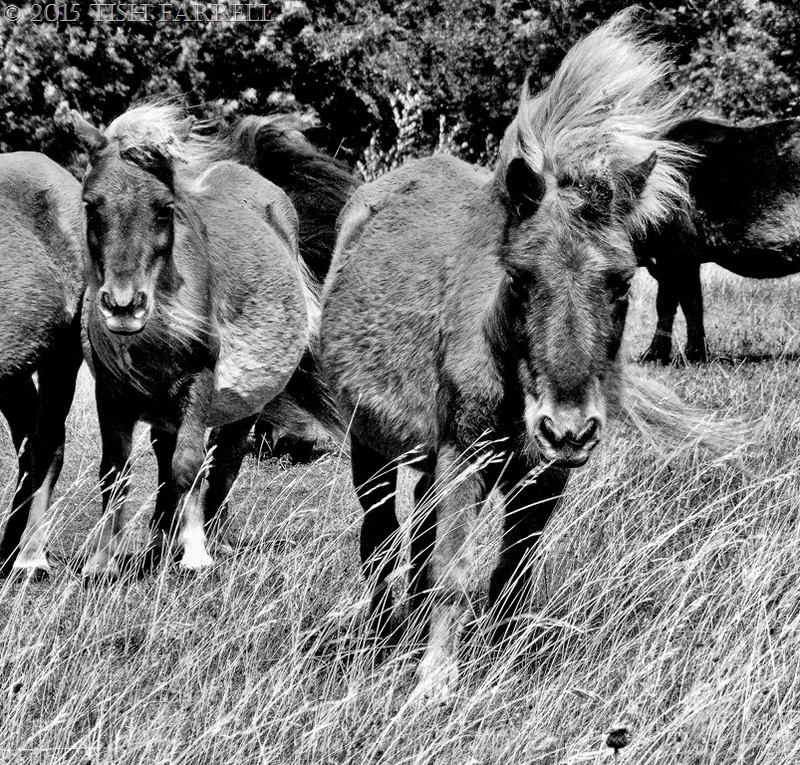 These little ponies remind me of Margaruete Henry’s book about the ponies of Chincoteauge Island. Lovely shots. Many thanks. I don’t know this book, but what a wonderful sounding island. I shall look it up. As I live in a country that has seen large numbers of refugees and some of the horrors of xenophobia, extending a hand and a smile can only but benefit in the short and long term. Many refugees will eventually want to return home, if possible, and who would want them to return with bitterness in their heart? Yes, England still conveys a sense of freedom: freedom to roam unimpeded and a general feeling of being reasonably safe. I know my folks still take the dogs for a walk at night either alone or with each other and never worry. As for the rain. Hoo ha! It has rained down here in Jo’burg for the past four days! Threw it down for the first two. We’re lucky we can all roam about the place mostly in complete safety. We tend to take it for granted too. And now I’m picturing your nice muddy dogs, which maybe means everyone is now muddy. I enjoyed following your stream of consciousness, Tish, from the rainy fall to climate change to refugees. We have an opportunity to practice compassion and help people who left everything behind except the clothes on their backs. Aside from the people fleeing war and extremism, there will be more waves of migrants as climate change begins to seriously displace people in various parts of the world. And it is all connected to the modern lifestyle we enjoy so much and can’t seem to reign in – everything has its price and the chickens are coming home to roost (or is it the ponies?). Roosting ponies, now there’s an image, Annette. But yes, you are right. It’s not as if many of these problems could not be dealt with, and the impact of climate change reduced for the most fragile regions. We know all sorts of ways of dealing with desertification that could benefit everyone. E.g. there are plants like jatropha that will grow on quite arid land, but could be used to produce biofuel. You just wonder when the tipping point will be reached, and if those who control the world’s geopolitics will ever wake up. I suppose they think their wealth will give them the means to be immune to the consequences of their actions. Yes, you’d think they recognize that they, too, live on this fragile planet and they and their families are not exempt from the consequences of it all. Maybe they are secretly planning a colony on another planet? All kidding aside, we need to wake up and make changes now which includes our consumption patterns, what we buy and throw away, how we use transport, which politicians we elect, which environmental groups we support….it takes a lot of awareness to not just go with the easy flow of things. Being a fanatical horse/pony lover Tish I loved your photos, and including the last one gives a real perspective of the size of these little ponies. Do you remember Thelwell and his delightful and naughty cartoon ponies? I also think that top mare may be due to drop her bundle soon. I hope you can get some photos of the tiny, tiny foal and mum. As usual there is much food for thought in your post and those poor displaced people are a sad sight as they try to find a safe place to bring up their families. I must keep a look out for foaling time. Btw, I still haven’t found out the variety of those very red apples in the allotment garden. Their owner lost the label. The ponies do belong to someone in the town. Yesterday we went to see how they were getting on, and found them happily eating the field that had been mown for them. A thought-provoking post indeed Tish. Refugees are a major issue here and the government lacks all compassion and understanding: abuse in detention camps is being ignored, and people don’t seem to be able to imagine themselves in a shattering situation. Who wouldn’t try to take their family to safety? The pope’s recent encyclical was full of wisdom, not specifically religious, and I long for the prime minister, a flaunting catholic, to pay attention: the pope too indicated over and over that we are all connected. Like you, I need to think about how I can do something other than tirade. We are blessed indeed Tish. 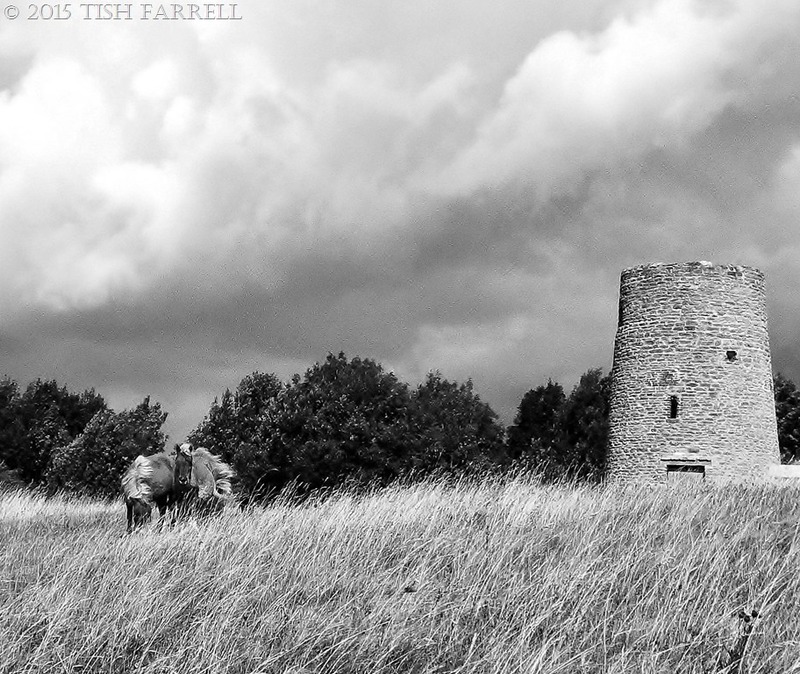 Your photos are so wonderfully atmospheric, Trish. I’m making jam and chutney out of a glut of Rhubarb – that loves the rain, too! I’m very envious – didn’t have a good crop of beans this year, so to have such a glut would be an amazing thought! Hope it passes the taste test next month! Sorry about your beans. I think I gave mine too much seaweed mixture.We’re eating them instead of pasta. This is a wonderful post….Like you I am so grateful for what I have and recognise fully that it’s so much more than most of the rest of the world…..The world has become a global village….technology has cemented that for us….and so we must share this world the best way we can… Nothing is comfortable right now…climate change is now beginning to cause enough issues that even the biggest skeptics are waking up, and coming from someone who is usually the ultimate optimist, I feel that things will only get much worse. I have always tried to live one day at a time…..and now it becomes even more important. I also heard the warnings about the weather to come…and so I would say time to batten down the hatches……on that note…good night…Janet. Battened indeed. But today looks like being lovely – mist on the bean field. Have a wonderful day. Yup the Pacific waters are warmer, quite swimmable this year if that’s a word. Just as the current refugee crisis is the tip of an iceberg, the current heating is just the beginning of some hard times, which is another challenge for governments and nations. But look, ms. Merkel is demonstrating some courage and humanity.